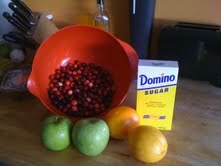 Thanksgiving sideshow: Cranberry deliciousness | Mom, How do I make this? Mom, How do I make this? Here’s a recipe for super easy, super fast, super delicious cranberries. Eat them for Thanksgiving or for a snack. Cut the apples from the core and slice up the oranges, including the rinds. 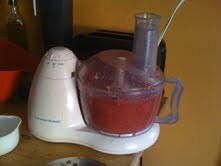 And blend blend blend until it’s a relish. It’s so good, you won’t believe. And really easy. Toss in the fridge and you’re ready to go!